I'm feeling quite nauseous today. Seeing as my two boys and my husband were sick earlier this week it looks like it's my turn. I'm caught in a state of wanting to eat because I'm hungry but feeling nauseous so I don't want to eat much and not eating much is making me feel even more nauseous. I just had some fat free yogurt with active cultures in the hopes that the cultures will do something to combat the 'bug' in my gut. Not sure it will work but it's worth a try. So far so good. I took a peak in the cupboard to see what else would appeal to my stomach. Low and behold I found a package of Ramen Noodles! The last time I ate Ramen I was getting over a bad case of the flu. That seemed to be the only thing that tasted good (because of the high sodium in the flavor packet I only used a scant amount for a little bit of flavor). Would I recommend buying them? - nope! 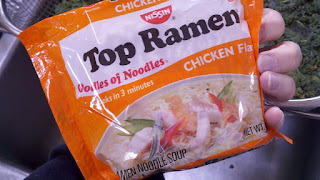 - but in my college days that was a cheap food and sometimes you just eat what tastes good to get anything down. After checking out the nutrition info on Ramen Noodles one package contains two servings and one serving is worth five WW points. If I feel desperate I may give it a try later on. To eat or not to eat that is the question? What would you do? There's another reason why I'm feeling nauseous today and that is over what happened to Lara Logan. I couldn't believe what I was hearing when I listened to the news last night. I'll spare you the details and let you read about it somewhere else online. I'm outraged at how something like that could happen. What is going on in a country where a women is assaulted in the streets during a 'celebration'? Hoping the nauseous feelings go away soon and something can be learned from all this. Lara my heart aches for what you went through. Sending you prayers of healing and comfort.